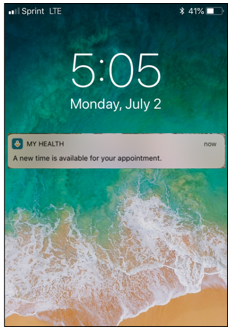 Vanderbilt Health is offering a new way to get an earlier, more convenient time for your next appointment if one becomes available. 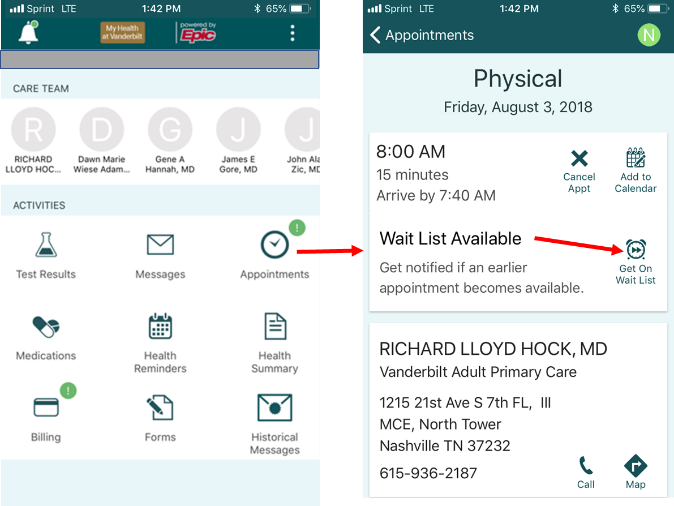 It's one of many new features in the latest version of My Health at Vanderbilt, our secure patient website and mobile phone app. To take advantage of this feature, make sure your My Health at Vanderbilt is active by signing in! You can do so by going to MyHealthAtVanderbilt.com. My Health at Vanderbilt is also available as a mobile app; download this app from the Apple App Store or Google Play. When you make an appointment in person or by phone, if we are unable to schedule you on your preferred date, we will offer you the option to be placed on a wait list. 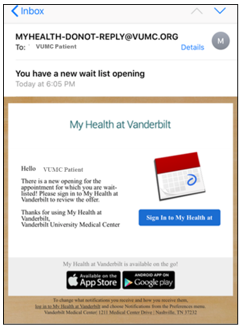 You can also place yourself on a wait list for most clinics on the My Health at Vanderbilt website or mobile app. Just locate your scheduled visit under "My Appointments" (in the website) or "Appointments" (in the mobile app). If it's available, select the "Get on Wait List" option. 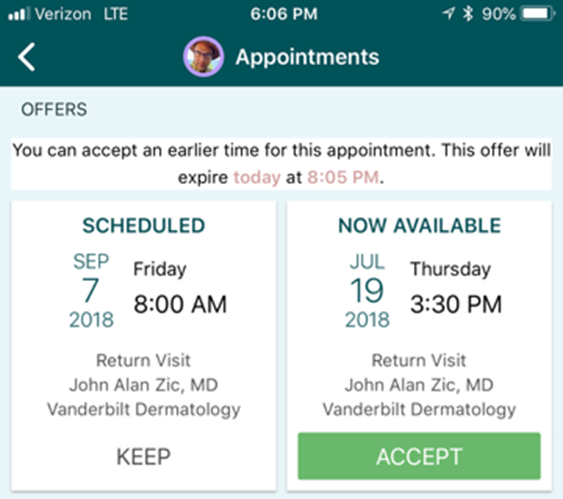 Once you are on a wait list, you will be notified by My Health at Vanderbilt as cancellations occur and earlier appointments become available. You can receive a notification on your phone if you activate the "Notifications" feature on the "Account Settings" page of the mobile app. Otherwise, you'll just receive an email. Sign in to My Health at Vanderbilt to claim the new appointment time or keep your existing appointment. You'll have 2 hours to accept. New openings are first come, first served. This is just one of the many helpful features in My Health at Vanderbilt. 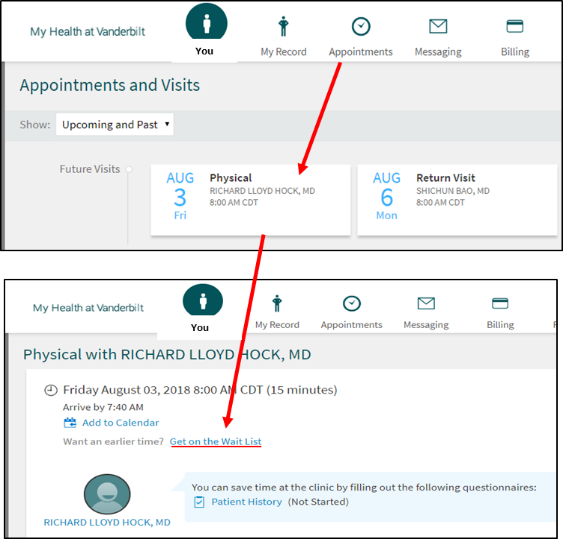 My Health at Vanderbilt is also the easiest way to communicate securely with your Vanderbilt providers, review and request appointments, check your medical records and test results, update prescriptions, and more. If you have any questions about appointment wait lists or My Health at Vanderbilt, please call (615) 343-HELP.